Easy to use & easy to set up. Up & running in 10 minutes! Powerful software. Scalable! Faster! Smartphone capable! Priced right. MAPCON starts out at only $30 per month! Outstanding customer service. Friendly and helpful service! Fully customizable. We'll satisfy your needs and preferences! Easy to use and easy to setup. Up and running in 10 minutes! Fully customizable. Your system, your way! MAPCON has worked very hard to create a maintenance application that is both easy to setup and easy to use. 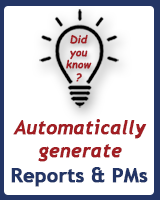 In fact, you can download our CMMS and create your first Work Order or generate your first PM in less than 10 minutes. MAPCON's basic version has been created with the busy maintenance manager in mind. No one wants to spend hours discovering how a new piece of software works. Today, customers expect that new software applications function as intuitively as possible with the shortest possible learning curve. After all, their job is maintenance management not educating themselves to use complex computer programs! MAPCON's basic version exceeds that expectation handily. MAPCON's robust maintenance software is used successfully throughout a vast range of facilities and industries by both experienced maintenance professionals as well as relatively less-experienced staff personnel without the need for extensive training. MAPCON has been designed to be as intuitive as possible while providing a huge array of features and options designed for our customers in a variety of industries. That's no small accomplishment! Nevertheless, MAPCON does offer in-depth training classes both here in our Midwest headquarters and on-site for customers interested in getting the most value from their implementation of MAPCON's premier CMMS. We also have many online classes. So, whether you need to get started without any hassle or are ready to take MAPCON to the next level, we can meet your expectations perfectly! If you don't want to re-enter all of your users, no problem! We can integrate with your current Microsoft Active Directory. The job is already done and now you just want to document it, no problem, use our after the fact work order process to record and complete the work in one step on one screen. We include common items to get you started quickly like a starter set of Equipment type identifiers called 'keywords'. Just assign them to your equipment and you are ready to go. We also include a set of common user profiles so you setup your system quickly by assigning these profiles to users which gives them quick access to the features they need and nothing else. No competing maintenance software package offers the sheer number of features and options that are contained in the MAPCON package at a price on par with our terrific value. MAPCON feels that maintenance managers shouldn't have to invest hundreds of thousands of dollars in maintenance management software in order to obtain the functionality MAPCON CMMS offers in its suite of standard features or in its optional modules. 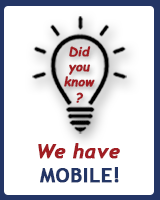 MAPCON is scalable, that is, our CMMS is designed to grow with you and your organization. When you first start out, you may not need or want advanced inventory capabilities. Or have a need to track timecards. Or advanced administration. So, why be forced to pay for them? With MAPCON you're not! But, it's nice to know you can step right up into our scalable CMMS package whenever you're ready. If you want a Chevy we have it. If you want a Cadillac, we have that too. Optionally though, MAPCON is proud to offer advanced modules including Administration, Human Resources, Maintenance, Inventory, Service Billing and System Utilities. Each of these modules dramatically expand the already powerful standard feature set supplied with our CMMS. Plus, MAPCON is designed to integrate seamlessly with databases such as Oracle, SQL Server and Firebird. MAPCON can also easily communicate with various other software packages including accounting packages, spreadsheets and word processors. And, while we're at it, no one matches our ability to provide CMMS in alternative versions. Want your maintenance software in a Web-based SaaS (Software as a Service) version? No problem. How about as a Windows Server-based system? MAPCON has you covered. Prefer an Enterprise solution capable of managing multiple sites spread across a wide geography? MAPCON has your system! Or, what if your organization requires unique customization to suit your specific needs and preferences? 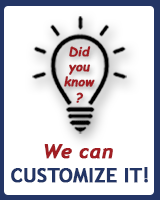 Well, we perform optional customizations for our customers all the time! So, no problem! Yes, MAPCON is easy to work with! 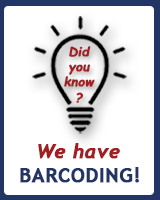 MAPCON wants you to use our maintenance software! As a result, we have designed MAPCON pricing to be affordable starting out and remain advantageous as you grow into our more advanced versions and modules. Our pricing is the most cost-efficient of any competitor in the CMMS Software industry. First, you will never pay for more maintenance software than you want or need! 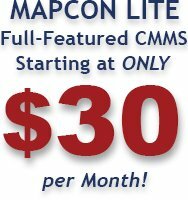 That's why our price for MAPCON's Lite version, a CMMS ready for any company, starts out at only $495! Or, we'll host it for you as a Web-based application at just $30 per month. 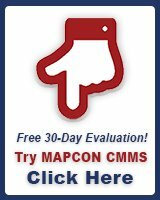 No quality CMMS is as affordable as MAPCON! — See pricing for our software. Advanced Administration — Options that allow the organization to take fuller control of the MAPCON presentation. We call these Optimizations. Advanced Human Resources — Allows the administration to track staff timecards, schedules and time off in regard to Work Orders and maintenance tasks and other related issues. Advanced Maintenance — Adds powerful functionality to Work Order tracking and efficiencies. Inventory Module — Allows enhanced parts and inventory tracking and re-ordering options. Advanced Purchasing — Adds purchase orders and invoice reconciliation capabilities. System Utilities — Provides additional report generator, labeling, SQL editor and other features. Competitors with comparable systems start considerably higher. So, MAPCON has the lower price. More importantly, MAPCON offers many more features and capabilities in a package designed to be both IT and User-friendly. — See pricing for our basic version. 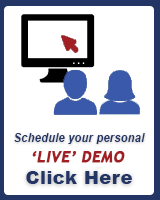 MAPCON offers an 'On-Demand' option for our maintenance software. This is a package sometimes referred to as "SaaS" or "Software as a Service" in which MAPCON 'hosts' your CMMS. 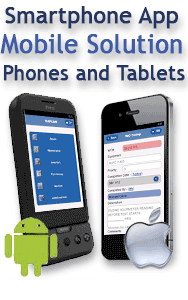 on our servers and your staff logs in from any workstation, PC, Smartphone or tablet. This is the way to go when your IT department can't – or won't – take on the extra load. If you want a Chevy we have it. If you want a Cadillac, we have that too. Your price starts at $30 per month, per User. — See pricing for our basic version. We have Enterprise, multi-site industrial operations with national and/or international units, as well as, large facilities, including governmental, corporate and college campuses, medical centers, resort and building complexes. MAPCON is a robust asset maintenance management application with an extensive feature set designed for multi-site, multi-zone management environments. Yet, it too is eminently affordable with a starting price of just $495. — See pricing for our basic version. MAPCON is proud of the customer loyalty that has inspired our employee-owners to treat all our customers just like family. MAPCON has been creating premier computerized maintenance management systems for facilities and industry since 1982. 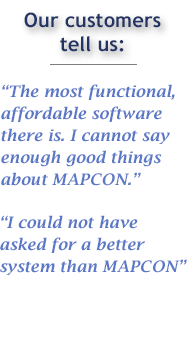 And, what has kept MAPCON in the forefront of quality CMMS? It's the type of service and after the sale support each one of our customers has come to know and expect. In the maintenance management field, whether our customer is a large, multi-national industrial business or a small fleet of taxicabs, it really is true that the customer knows best. It's the customer who knows his or her business and cares for the important assets and equipment that make their operation run smoothly. MAPCON has learned that these maintenance professionals are the critical components in the design and functioning of our CMMS application. We seek their advice. We want our customer's opinions! 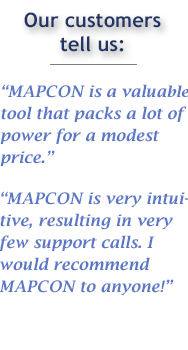 MAPCON responds to customer insights swiftly and we appreciate customer feedback whether positive or negative. 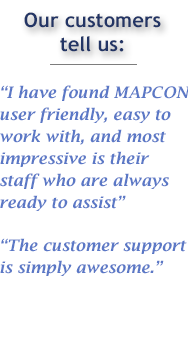 The employee-owners at MAPCON are the ones who provide support and assistance to our customer family! We don't farm out support calls to another continent. Our customers never have to worry about being shunted off to an hourly rate 'representative' looking for answers on a computer screen thousands of miles away from our headquarters. When you contact MAPCON, you will reach one of our employee-owners in our offices here in the Midwest of the United States. Every time! All the time! Already a MAPCON customer? Then a hearty THANK YOU to you and your staff! Thinking of becoming a MAPCON customer? We can't wait to welcome you to our family! No two customers are alike. MAPCON has been delivering premier maintenance software to organizations large and small across the globe for over 30 years. We discovered long ago that the preventive maintenance objectives of an important regional gas utility may have significant differences from the maintenance management requirements of, say, NASA. 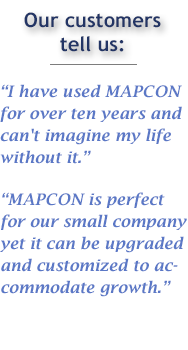 MAPCON customers know that our company stands ready to make our CMMS software reflect the unique needs and expectations of those who see a need to customize our CMMS application. Customization is an optional opportunity for business and government entities interested in certain modifications in our CMMS functionality. MAPCON always stands ready to meet your unique needs and expectations. MAPCON is one of the world's premier asset maintenance management tools. Used by facilities and industries worldwide, we are justly proud of what we firmly believe is the very best combination of CMMS packages available anywhere at any price. Nevertheless, MAPCON stands ready and willing to make customer-requested customizations whenever the needs arrive and the customer feels the necessity justifies the cost. Specific interfaces to Corporate ERP, Purchasing, Inventory and General Ledger systems. Read runtime or alarm information from PLC or Building control systems to generate work orders, PM’s and trending information.